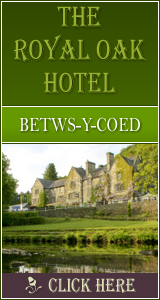 Set in its own (gated) grounds and only 5 minutes drive from Betws-y-Coed, 'Ty'r Bont' is situated next to Rhydlanfair Bridge at the edge of the Snowdonia National Park, surrounded by National Trust forest and farmland. Ty'r Bont possesses charm and character with its original features of oak beams and 2-ft thick stone walls, inglenook fireplace and quirky rooms, making it a quaint and cosy retreat. Guests are accommodated in their own 3-room suite comprising: 1 double room, a small cozy lounge with en-suite shower room, and an open tread wooden stairway leading to a twin-bedded loft room. Facilities include: a refrigerator, colour T.V., hair-dryer, clothes iron, clock-radio and tea & coffee making facilities. BREAKFAST: Guests are treated to a hearty Welsh breakfast, cooked using local produce. This includes freshly baked bread and free-range eggs (from our own hens), served with a choice of fresh fruit, fruit juice, yoghurt, cereal and croisants. Vegetarian and vegan diets are catered for, upon request. Located close to Mount Snowdon and Betws-y-Coed on the A5, Ty'r Bont's rustic cottage setting, offers the tourist in North Wales, a perfect base from which to explore the area. cottage and a number of footpaths invite walkers to explore the wonderful walks in the surrounding countryside. Ponies and sheep graze peacefully nearby. 1465 Click Throughs => �732.5 Since 13/May/2013 based on an example �0.50 cost of a click through from Google pay per click. The click through ratio to this accommodation provider's own website Since 13/May/2013 is 18% .